WW1 cap badge, Canadian 14th Battalion. 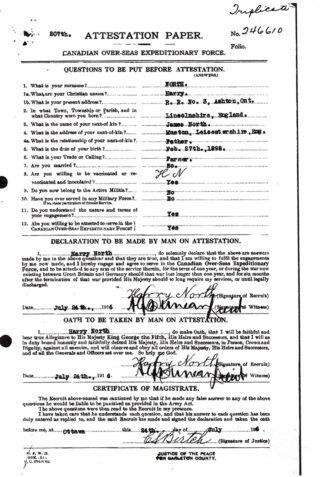 Harry North's attestation paper, completed at Ottawa 1916. Harry North was born on 27th February 1898 in Great Gonerby, near Grantham, Lincolnshire. His father was James Hand North was a joiner, born in Great Ponton, Lincolnshire in 1858: his mother was Rebecca Patchett, born in Muston in 1860. James North was a Methodist Preacher. In 1891, they lived at Great Gonerby, with five children: Edith, born in 1880 at Plumstead, Kent; Sarah (b.1882) and Alice (b.1884), both born in Belgrave, Leicester; Elizabeth (b.1886) and Jane (b.1890) both born in Great Gonerby. By 1901, they lived on the Green, Muston. In addition to James and Rebecca, there were six children. Edith, working as a dressmaker, and five not on the 1891 census: Gertrude (b.1890), Edwin (b.1893), Arthur (b.1896) and Harry (b.1898) and Doris (b.1900), all born in Great Gonerby except Doris, who was born in Muston. In 1911, Harry was attending Muston school, and the only other one of the children at home on census day was Harry’s younger sister, newly married Doris Pratchett. Sarah North married Ernest Jones from Wilmslow, Cheshire, and they emigrated to Australia. Ernest Jones enlisted with the Australian forces but sadly became one of the casualties remembered on the Muston War Memorial. Harry North probably emigrated to Canada shortly before the outbreak of WW1 and enlisted with the Canadian Army. However, the record of his crossing the Atlantic has not been discovered. There was a H.H. North, a 17 year old weaver, who sailed from Liverpool to Halifax aboard the SS Hesperian, Allen Line, in February 1914, but he appears to have been accompanying Joseph North, aged 49, also a weaver, who was presumably his father, and so is not likely to be the man from Muston. There are records for Harry North in the Canadian Army during the First World War. 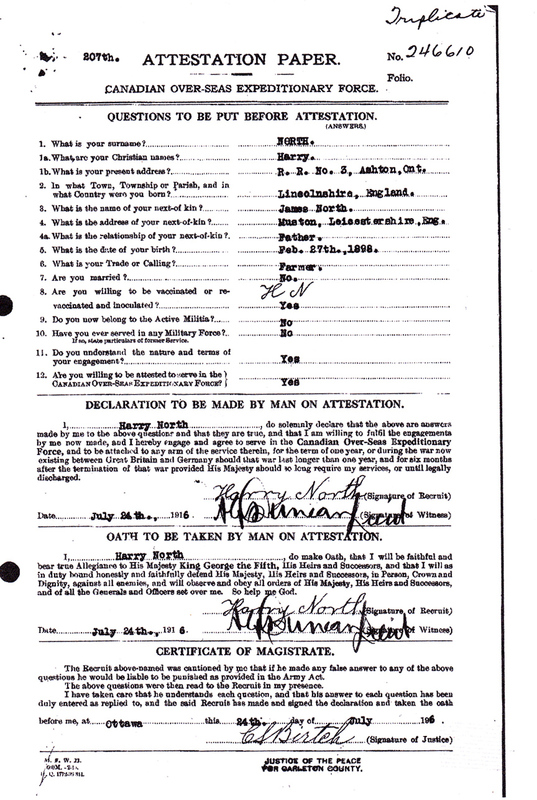 He signed his attestation paper on the 24th July, 1916. At that time, he was a farmer, living at R.R. No.3, Ashton, Ontario. His Army Service number was 246610, and he stated his willingness to serve in the Canadian Over-Seas Expeditionary Force. No further details of his service records have been discovered., though it is clear that he survived the war and returned to Canada. Harry North married Bertha Victoria May Kirk on 9th August 1926 in Carleton, Ontario. They moved to New Jersey, and in 1930, they lived in Orange, Essex, New Jersey, where he and worked as a sawyer. Later, they lived in Clifton, Passaic County. In 1940, Harry had become a shipping cerk. Harry North died on the 30th July, 1953, in Allwood, Passaic County, New Jersey, USA. An article in the Grantham Journal of 1939 refers to A. North from Carlton, Nottingham, who had been traveling across Canada, and in British Columbia had visited a Methodist Church where by pure chance he met John Henry and Sarah Carman, brother and sister who had emigrated from Muston in 1914. It is tempting to speculate that the ‘tourist’ was Harry’s brother Arthur who might have made the journey to visit Harry and meet his family, and then make a journey across Canada. In the 1939 register, there is the record of a Frederick Arthur North born on the 14th August 1895, a master-joiner, residing at 324 Carlton Hill, Carlton, Nottingham, with his wife Alice (b.14th Sept. 1897). Though given as Arthur in the 1891 census, his name was Frederick Arthur in the Register of Births and also in the Muston school admissions register of 1899 (in which Harry North was also present).